Researchers in Sweden have just published the results of a two year dietary intervention involving obese postmenopausal women. The results and implementation leave much to be desired in terms of providing any useful information vis a vis the diets tested. I blogged on this HERE. But if one looks past the diet comparisons, I believe there is some useful information to be had. I would like to highlight this in this post and however many more I have the time for or choose to break it up into. I say mildly obese by BMI standards, because they were not that far over the the generally accepted threshold for obesity of BMI=30. And yet, body composition was evaluated and this yields a more disturbing measure. These women were quite a bit more obese when evaluated by body fat percentage (~47%). I hope to blog soon on what I call my calorie conundrum. This is a long languishing "controversy" of sorts where some have felt that I "fell in" with a bad breed of calorie deniers on the other extreme of things. Part of this stems from people flat out misinterpreting or misrepresenting what a lot of "those" people actually say and believe, and part of this is a fair questioning of what the appropriate caloric intake is for any given person. Like I said, this is something I need to flesh out more in a dedicated post. I have written quite a few times here about calories and how 1500 calories is not a starvation diet for many, perhaps most, women, as well as perhaps pretty darned close to maintenance requirements for some average women. This has not been met well in corners of every community. While I have no doubt that intake is notoriously under-reported, aside from a few nuances, my commentary in this post still stands: Starvation Diets? 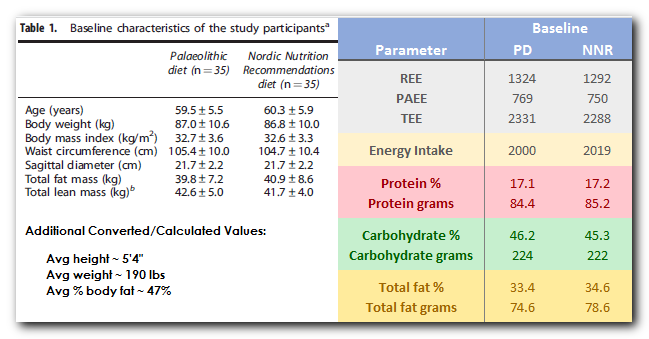 For the remainder of this post, I shall refer to the paleo and NNR diet comparison study as simply "the study". I constructed the table below using seven randomly selected energy expenditure calculator/estimators and added the study data at the bottom. I first put in the age, average height and starting weight of those women, and also recalculated for an average 5'4" woman at 130 lbs. For the paleo/NNR's (in italics) I used the 190:130 lb comparison from estimator 5 to estimate what these women would expend if they lost 60 lbs. Before moving on, I'm going to quote how energy expenditure was determined in the study. Resting energy expenditure (REE) was measured at baseline and after 6 and 24 months using indirect calorimetry (Datex-Ohmeda Deltatrac II...) with breath-by-breath sampling. Diet-induced thermogenesis, that is the production of heat after eating, was fixed at 10% of the total energy expenditure (TEE) for all individuals in the study. TEE was calculated for each participant as the sum of the PAEE and REE, divided by 0.9 and expressed as kcal or MJ per 24-h day. It would appear that they used the Actiheart to calculate the TEE by entering the measured REE, and the DIT (aka TEF) is 10%. I unfortunately don't have time to track down the predictive accuracy of this activity monitor, so we'll have to take the measurement accuracy on face value and with the caveat that they could be off. Feel free to chime in the comments if you have any info in this regard! The first lesson we learn from my table above is that estimations of energy expenditure are pretty widely variable depending on the calculator used. I've been doing quite a bit of research into this and will be blogging and/or writing on most of it as one of my chosen focuses for this upcoming year. 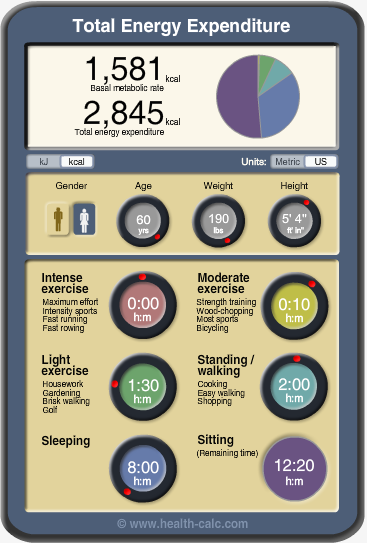 The measured TDEE of the women in this study most closely matched Calculator 7 with Moderate Activity, with a reasonable match to "just to keep going" on Calculator 3. Now 2300 calories/day seems a bit high for a 60 year old woman ... but then we remember that these are women averaging 190 lbs at 5'4" tall. If we are to believe the more generous "just to keep going" calculator, this same woman would have to eat roughly 600 fewer calories per day to weigh 130 lbs. The moderate activity calculator is a bit more generous with calories at the lighter weight, only requiring about 400 fewer calories. Since this calculator is described in greater detail, I'd like to look at it further. The part in [ ] is the Harris Benedict Equation which would net our woman a 1455 cal basal energy expenditure. My numbers don't quite square up with the calculated values but I'm not going to sweat it. Sedentary = 1.2: Very little or no daily physical activity.Lightly Active = 1.375: Light physical activity 1 to 3 days per week.Moderately Active = 1.55: Moderate physical activity 3 to 5 days per week.Very Active = 1.725: Hard physical activity 6 to 7 days per week.Extremely Active = 1.9: Hard physical activity every day of the week. Subjects were instructed to keep a record of all food items consumed over 4 consecutive days (three weekdays and one weekend day) and to describe and estimate the amount of food eaten by using coloured food-portion photographs representing known weights and household measuring utensils (for example, cup, spoon and standard weight of food items). Maybe Reporting is Accurate for a Change? 5'4", 60 year old woman ... 2000 calories per day = 190 lbs ? It is important to keep in mind that the various calorie calculators were generated by various regression analyses of hundreds of measurements. The diagram below is from this review of the Harris Benedict equation. In other words, these were some of the measurements used to derive this equation. The scatter doesn't look too bad, but this is minimized somewhat by the scale chosen. For example if we expand the data (and imagine dots instead of the globs it becomes) it looks like this. But back to the top plots. On left, at the ~1300 measured BEE, we predict anywhere from about 1200 to 1450. On the right, for ~1300 predicted, the actual measured values would range from ~1100 to 1450. Therefore I think it's important to keep in mind when trying to figure out if you're an outlier, or if your client is lying to you or what, remember that individual variability is quite high. In the study, the standard error of the mean (a measure of variation) was on the order of 50 calories or less which would make the standard deviation at most 150 calories. However, we know nothing more about the data distribution, range, etc., so to speculate about the range would be irresponsible. All that said, at least in this study, there seemed to be some remarkable consistency over time. Total energy expenditure dropped on average only by about 50 calories before recovering. I think it's a fair assumption that the caloric deficits were, if anything, overstated, but ranged from an average of 250 to 400 calories. Thus it is not surprising that adaptive alterations in energy expenditure were not observed. This is speculation on my part, but I tend to believe the beginning intake was probably closer to accurate, the activity monitors overestimated physical activity expenditure, and TDEE for these women was around 2000 cal/day to maintain 190 lbs. While one might make the case for a better metabolism if they gained more lean mass, if they preserve the lean they have with resistance, they would be about 22% body fat at 130 lbs, that is in the "fitness" range here. Certainly building some lean muscle would help, but the caloric "expense" of lean tissue has been quite overstated. 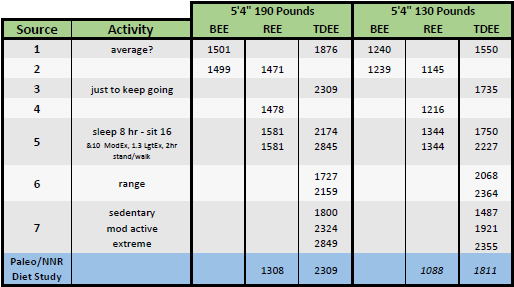 Using the Harris Benedict model, I (italics) estimated what these women's caloric expenditures would be at 130 lbs, and we see that REE is 1088 with TDEE of 1811. Again, this might be higher if activity were increased or perhaps if you added 10 lbs of muscle, but it is important to recognize this is average. Therefore, it is quite conceivable for this woman to have daily energy needs a couple hundred calories below or above that. If they are below, then this woman eating what many consider to be "normally" can easily become overweight or even obese. I always considered myself short. Perhaps that's because I was the second shortest person in my grade school classes and seemed to plateau at 4'11". Then all of a sudden I'm 5'4" and my friends were almost always taller than me. And then I read somewhere that this was the average height for a woman. Wikipedia lists it as 5'5". No matter, this gives the standard deviation of 2.5" that (another has mean of 63.7 and std. dev. of 2.7) is likely a reasonable estimate. This means that the range of usual values for female height is between 5' and 5'10" and includes 95% of women. Lots of women in the low 5-foot range likely have a daily energy expenditure close to that 1500 calories/day that is the usual "diet" intake, and all the lifting in the world isn't going to change that. The Harris Benedict model seems to be OK for an approximation. I would not recommend using one calculator that is popular with some (#5 on my list). This calculator seems to be more advanced because of the more detailed activity. However, values for the table above were determined as shown at right. As you can see I put very modest activity in there of 2 hours standing/walking, 1.5 hours light "exercise" (including such things as gardening and housework) and 10 minutes of moderate exercise for the day. That is a very high estimate for caloric expenditure for what I imagine a woman in this study would qualify for activity-wise and 500 cal/day surplus vs. what was measured. My preferred method if you can't get your REE measured, would be to start with H-B to estimate TDEE and consume that amount for a while of simple, easily digested foods. Cut back if gain, eat a bit more if you lose. Average it out for a week ... go from there. Not everyone is the tracking type, I for one am no fan of doing it, but there are worse things too. Using the Hall and Chow simulator and I get 1608 for a sedentary 5'4" 60 year old who weighs 130 lbs and 1989 if she's 60 lbs heavier. I think comparing the effect of activity levels between calculators is tough, because they all define activity differently. For me, the H&C simulator works pretty well (in that I can recreate my weight gain history plugging in my age and past average calorie intake), but I don't have a history of yoyo dieting or severe long term restriction. By your own admission 47% body fat females aren't exercising at the numbers you put into the health calc. Any studies that don't use doubly labeled water underestimate intake. Here's one on average >70 year old, the females in this study were BMI 27, wt ~153 pounds average and TEE (by doubly labeled water) was ~2254. 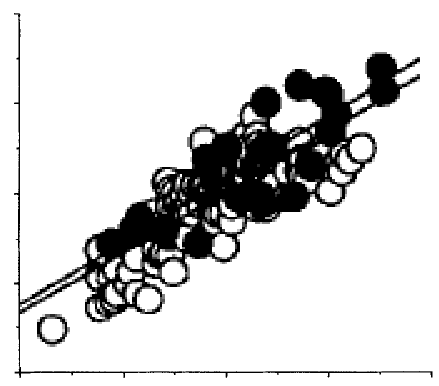 The Journal of the American Dietetic Association (I believe) once had a study looking at all of the various calculators (not including Hall's) and it crowned the Mifflin-St Jeor the best as compared with indirect calorimetry results. Where did you get that? The ALF for these women would put them between moderately active and very active -- comparing measured REE to TDEE. It seems more likely their PAEE may be overstated using the device/method they did. Still, you would call 10 min moderate activity, 1.5 hrs light activity and 2 hrs standing to be exercising to some great extent? As opposed to sitting? In my table I put in the sedentary numbers ... full on sedentary as in sleep 8 hrs and sit 16 hrs. This calculator has energy expenditure for that state at almost 2200 calories. Note that in my scenario (screenshot) the person is sitting for over 12 hours a day! That's "exercising"?? Any studies that don't use doubly labeled water underestimate intake. I'd be careful to say *any*. Also, while DLW is pretty accurate under controlled conditions, it can be 10% or more in error in practice. Here's one on average >70 year old, the females in this study were BMI 27, wt ~153 pounds average and TEE (by doubly labeled water) was ~2254. Here's one from the related studies pub med sidebar where the 74 year old 130 lb women with BMI 24 had DLW TDEE of ~1560 cal/day. Thanks Yoni! I'm going to be blogging on this some more as I'm working on a calorie book and this has been part of my research. I believe I recall which study that was, I'll try and track that down on my hard drive. I have another one, or perhaps it's even that one, comparing estimations for lean vs. obese. Also mean estimating mean doesn't show the full study. In the study I'm talking about they gave rates of erroneous estimation ... in one (top of the head here but pretty sure I'm recalling this correctly), estimation missed calculated in 50% of obese subjects. Having the luxury of an indirect calorimeter in my office (we check everyone's) I can tell you that all the equations underestimate for those with obesity. Which is why when we get someone who is at their predicted values we tell them their REE is less than we'd predict and on those really rare cases when markedly slow (and they do indeed exist), it can really make things a challenge. I didn't put it in the first post to avoid the spam filter. I pasted the link into a reply, but it seems to have disappeared. Did you get it or did Disqus eat it? Disqus changed up its dashboard again. Finally figured out how to access Pending comments with links! Uggh. Interest post. I, too am a short woman - 5'2", and find my calorie needs are not much above "starvation level" - currently eating at a slight deficit of 1600/day, but f I go lower - to 1400 - I'm too hungry - those 200 calories make all the difference. That TDEE calculator is an eye-opener! I first found that calculator through GoKaleo & also had reservations about it, so I switched back to Harris-Benedict. It only gave me a difference of 100 cals/day but for short women that really adds up over time! Since you mentioned it, do you happen to know how the ACE calculated the bodyfat charts? While I am trying to lose a few pounds, I don't think if myself as fat OR unhealthy. I had a DEXA scan last year and my BF was 40% - shocking, especially since I was coming off a 35lb weight loss (dread to think what my BF was at my highest weight!) I'm trying to get to 30% but sometimes I wonder if this is just a marketing tool and based more on aesthetics than health outcomes. Susan, I'm guessing that you were somewhere around 135-140lbs when you had the DXA scan, meaning an LBM of approx. 82-84lbs? If you managed to retain all of the LBM during weight loss (not a given, as you know, but I'm not about to enquire about your age to estimate the likelihood of you gaining rather than maintaining/losing LBM) then you'd need to attain the weight of approx 120lbs to reach 30% BF? "Currently accepted body fat percentage cut-points for obesity are 25% for men and 30% for women. For the purposes of this study, we identified the following groups based on percent body fat: for men <14% (Very low), 14%–17·9% (Fit), 18%–24.9% (Overweight), 25%–34.9% (Obese), 35%–39.9% (Morbidly obese), ≥40% (Super obese); for women <15% (Very low), 15%–24.9% (Fit), 25%–29.9% (Overweight), 30%–39.9% (Obese),40%–44.9% (Morbidly Obese), ≥45% (Super obese)." "A cross-sectional study of adults with BMI, DXA, fasting leptin and insulin results were measured from 1998–2009. Of the participants, 63% were females, 37% were males, 75% white, with a mean age = 51.4 (SD = 14.2). Mean BMI was 27.3 (SD = 5.9) and mean percent body fat was 31.3% (SD = 9.3). BMI characterized 26% of the subjects as obese, while DXA indicated that 64% of them were obese. 39% of the subjects were classified as non-obese by BMI, but were found to be obese by DXA. BMI misclassified 25% men and 48% women." "Table 2 demonstrates the discordance seen between classifications of obesity based on BMI versus percent body fat. While there was agreement for 60% of the sample, 39% were misclassified as non-obese based on BMI, while meeting obesity criteria based on percent body fat. Only 1% was classified as obese based on BMI, but non-obese by percent body fat. A total of 48% of women were misclassified as non-obese by BMI, but were found to be obese by percent body fat. In sharp contrast, 25% of men were misclassified as obese by BMI, but were in fact non-obese by percent body fat (i.e. the muscular body morphology). "...women had clear correlation between advancing age and % misclassification [as normal weight by BMI rather than the sarcopenic obesity revealed by DXA scan]. 48% of women ages 50–59 misclassified, and 59% were misclassified by age 70+. This association with advancing age was not observed in men." Using EasyHits4U you can earn free advertising credits by visiting other ads from a account base of over 1,200,000 accounts. Earn advertising credits fast with a view per view model.